One Shot Flushing and Descaling Liquid. Power Flush FX2 is designed for use with CLEARFLOW power flushing pumps, and is the flushing liquid to choose for the most rapid and effective results. It is a vigorous 'one shot' flushing and descaling liquid which starts to work immediately upon addition to the system. It enables heating engineers to thoroughly cleanse a heating system in just one visit, a significant benefit when so many households have both partners working full time. When using Power Flush FX2 there is normally no need for a prior visit to pre-treat the system with flushing chemicals several days before the power flush, saving on expense and inconvenience. 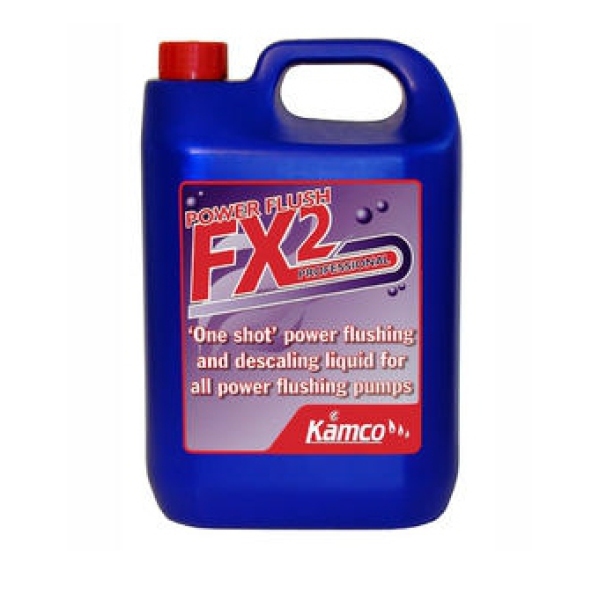 Power Flush FX2 rapidly dissolves and mobilises the rust, sludge and corrosion deposits which accumulate in systems as a result of gradual decay, whether from corrosion as a result of bad design and air ingress, or lack of an effective corrosion inhibitor. Removal of these deposits can cure or prevent circulation problems such as completely or partially cold radiators, frequent circulating pump failure and boiler noises caused by debris accumulating in the heat exchanger.